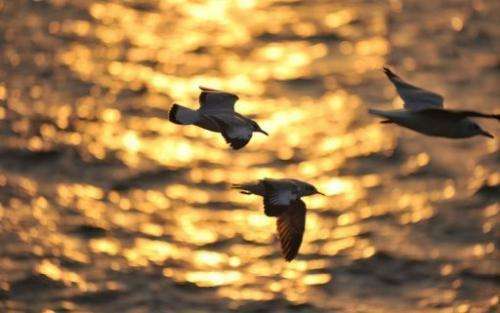 Seagulls fly over the Arabian Sea during sunset, in Mumbai on December 20, 2010. Earthquakes can rip open sub-sea pockets of methane, a highly potent greenhouse gas, according to a study by German and Swiss scientists published on Sunday. One of the cores has now been found to contain methane hydrates—a solid ice-like crystalline structure of methane and water—only 1.6 metres (5.2 feet) below the sea floor. Also uncovered were tell-tale signatures from water between sediment grains, and concentrations of a mineral called barite. "We started going through the literature and found that a major earthquake had occurred close by, in 1945," said David Fischer from the MARUM Institute at the University of Bremen. "Based on several indicators, we postulated that the earthquake led to a fracturing of the sediments, releasing the gas that had been trapped below the hydrates into the ocean." Over a likely period of decades, around 7.4 million cubic metres (261 million cubic feet) of methane—equivalent roughly to 10 large natural-gas tankers—belched to the surface, the authors calculate. According to estimates published last week in Nature, the leakage of 50 billion tonnes of methane from the thawing shoreline of the East Siberian Sea—part of the Arctic Ocean, which is one of the Earth's hot spots for warming—would inflict costs almost as big as the world's entire economic output. "According to estimates published last week in Nature, the leakage of 50 billion tonnes of methane from the thawing shoreline of the East Siberian Sea—part of the Arctic Ocean, which is one of the Earth's hot spots for warming—would inflict costs almost as big as the world's entire economic output." "No evidence in ice cores of spike in CH4 for recent periods in the past with warmer Arctic (~8000 yrs ago or ~125,000 yrs ago) (3/n)"
Well, I'm sure it will soon be "proven" that the earthquakes were caused directly by the fracking of the evil Exxon, whose employees made it doubleplusungood by driving their SUVs to the drilling sites. Aha --first on the scene with the usual moron denialist comments are geokstrap and NikNikFromDickCity. One claims to be a "scientist" and the other claims to own a brain. I'll leave it to other readers and commentors to debate which of the two claims is the more dubious, as there is certainly no merit to be found in either's comments. Madcap bungle: to use bots to auto down rate skeptical comments but then impulsively spit debate unworthy bile below, to five star inform casual filter users that skeptical comments exist behind their filter setting! And you want these people as policy advisors? Rating them five stars only takes a second and helps expose the real face of Global Warming "science." It was amusing to see Motl Fired from the University for being such a fool. Now he has lots of time on his hands to run his Kookie conspiratorial web page. Actually Schmidt says nothing of the kind if the link NikkieTard provides. In fact, what Schmidt says is that one should not link Global Warming Denialism with Holocaust Denialism because it will upset the denialists. But clearly there is much in common with Holocaust denial and global warming denial, even though Schmidt would rather not see that fact widely presented. Like every Criminal, NikkieTard would rather not be punished for the crimes he commits. I say hang em high. (1) From the Wikipedia entry on Fenton Communications: "EMS is closely allied with Fenton Communications (where they shared the same office space and personnel)." (2) From VendicarE's link: "The spirit of EMS will live on through Science Communication Network"
"If greenhouse-gases continue to increase at the present speed, they will reach twice the level of gases before industrialization. In other words, instead of a reduction of 50 per cent, they will increase by 50 per cent and will pose a real challenge to the natural environment." If the USA continues to reduce its emissions via fracking, Arabia is out of business! When did questioning and analyzing scientific speculations become "denial". It is THE most important part of scientific investigation. It is a sad day for science when the scientific method has been thrown away for religious zealotry. It seems if the priests say so no one had better disagree. Very sad. have all the charm and attraction of a deceased rat which suffered from leprosy and incontinence. There is informed speculation; and then there is unfounded speculation. The denialists present here are for the most part those who engage in the latter; the balance simply deny that which may have consequences that they don't like.